Photo: John A. Cottrell House, ca. 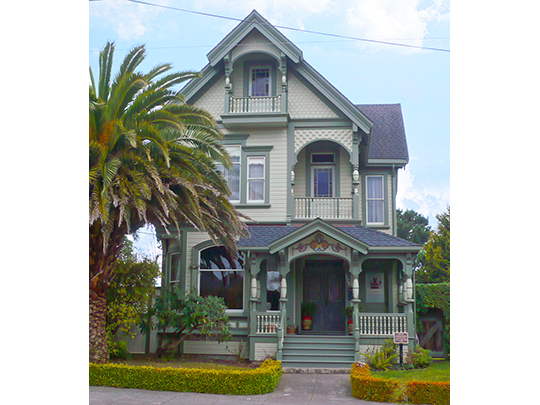 1900, 1228 C Street, Eureka, CA. Listed on the National Register of Historic Places in 2005. Photographed by User:Ellin Beltz	(own work), 2014, [cc0-by-1.0 (creativecommons.org/publicdomain/zero/1.0/deed.en], via Wikimedia Commons, accessed March, 2016. Humboldt County administrative offices are located at 825 5th Street, Eureka, CA 95501; phone: 707-445-7266. Humbolt County was formed in 1853 from part of Trinity County. Spanish travelers were recorded as having visited the area as early as 1775. The Bay and County are named for Baron Alexander von Humboldt [1769-1859] a Prussian explorer, geographer and naturalist.